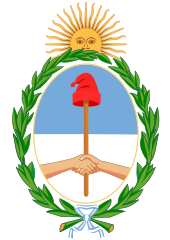 The Chamber of Deputies is the lower house of the Argentine National Congress. This Chamber is the only one to levy taxes; to draft troops; and to call the President, cabinet ministers, and members of the Supreme Court before the Senate. There are 257 seats. One-half of the members are elected every two years. Members must be at least twenty-five years old. They must have been a resident of the province they represent for at least four years. Each province has one deputy per 161,000 people. Then each province gets 3 more deputies. The minimum number of deputies is five. This page was last changed on 11 May 2016, at 04:49.